First the frame needed rust removed and to be painted. I used a rust-bonding paint at first, but it didn’t seem to bond as it should have. Possibly the damp and cold weather caused the problem, but I soon switched to plain old Rustoleum-type paints. This stuff worked well, sticking and covering smoothly. 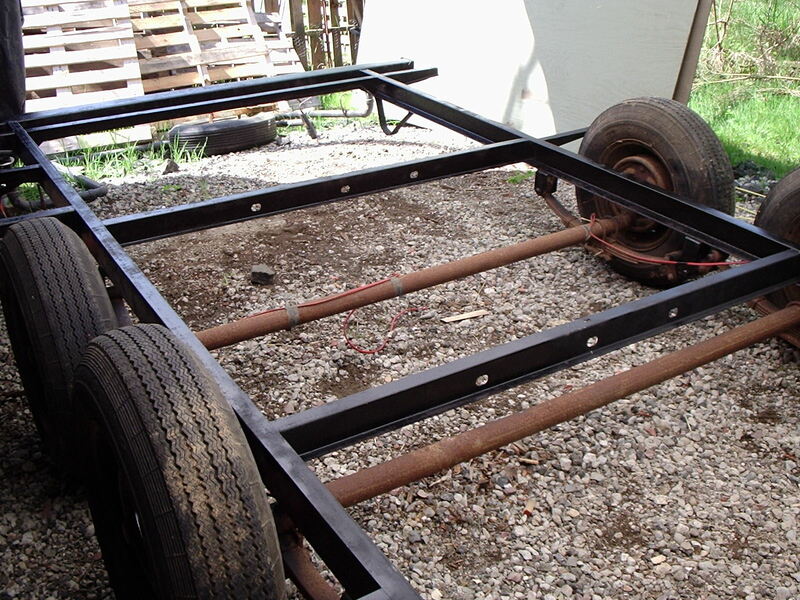 The tires and axles need to be replaced, contrasting markedly with the painted sections. The tires are rotting, and the brake wiring is cut. The old axles actually work and are strong, although old. I will be replacing the tires, and probably the axles in the future. Once the paint was dry, it was time to start the new build! This is picture-heavy, as I wanted to record lots of details. The camera used is pretty old and I apologize for the picture quality. One of many hauls from the local Restore. I got the whole box for $15. Not visible are 2 unopened boxes of heavy metal strapping, a real find. 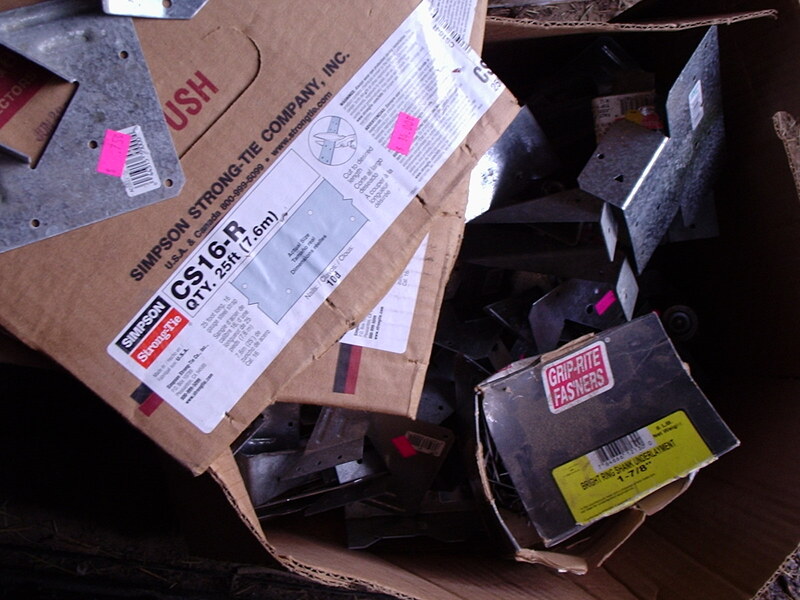 Approximately 75% of the metal strapping, fasteners, and whatnot came from a local Restore. I did some comparisons of what I paid vs. costs at local big box stores, and found I often paid only about 10% of retail. I checked out the two Restores close to me at least once a week, and usually more often than that. The gas used was more than offset by the great finds. 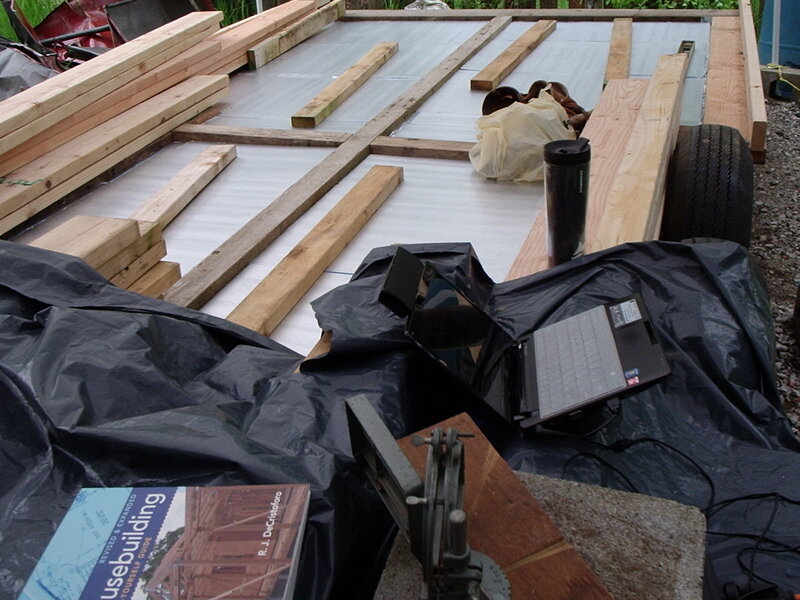 I couldn’t afford metal sheathing, plus I have a lot of thin plywood on hand. So, I made this non-load-bearing wood layer to protect the floor insulation. The underside of this plywood is completely painted with Behr Premium Plus Ultra exterior paint to repel water. I have 4 gallons from the “oops paint” section of local big box stores that cost $5 each. I’m not overly worried about not using metal sheathing, as although it makes a superior insect/critter barrier, it is very prone to condensation – and water getting in is my worst nightmare. 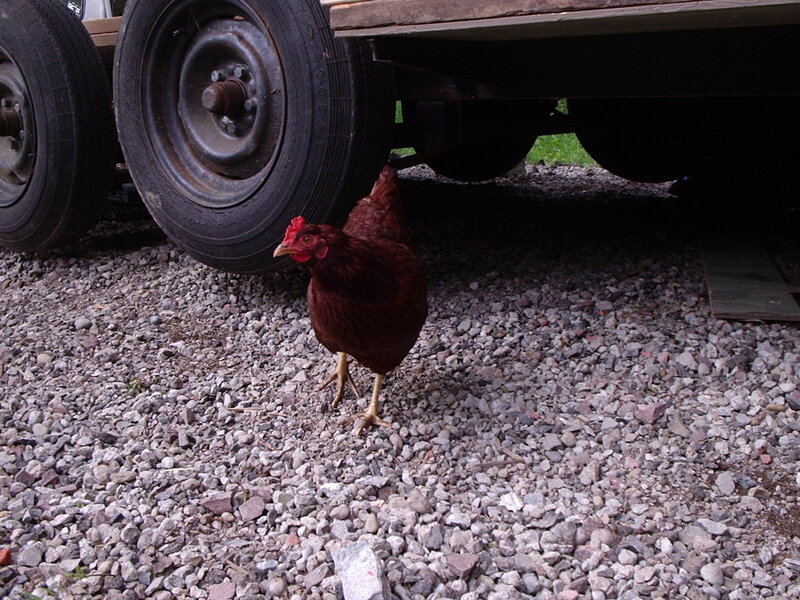 Chickens and turkeys are fascinated by the activity, and would often come by to check it out. It’s never lonely, even when I am alone. Too bad they can’t give me a hand…. There are requirements for building in the Pacific Northwest, which include a canopy and coffee to fend off weather effects. 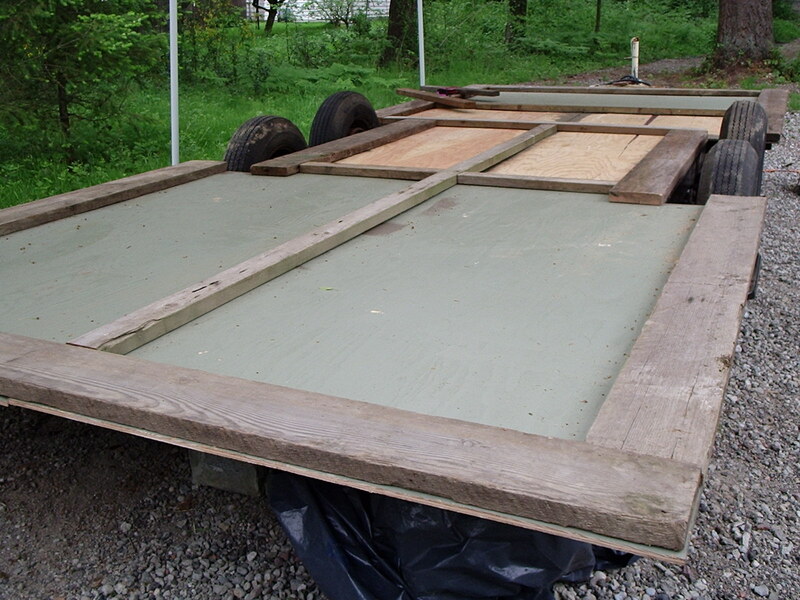 My new 10′ by 20′ canopy made it possible to work on the trailer and flooring even in late winter/early spring. Cost a lot, but I’ll use it for other things after all this is complete. 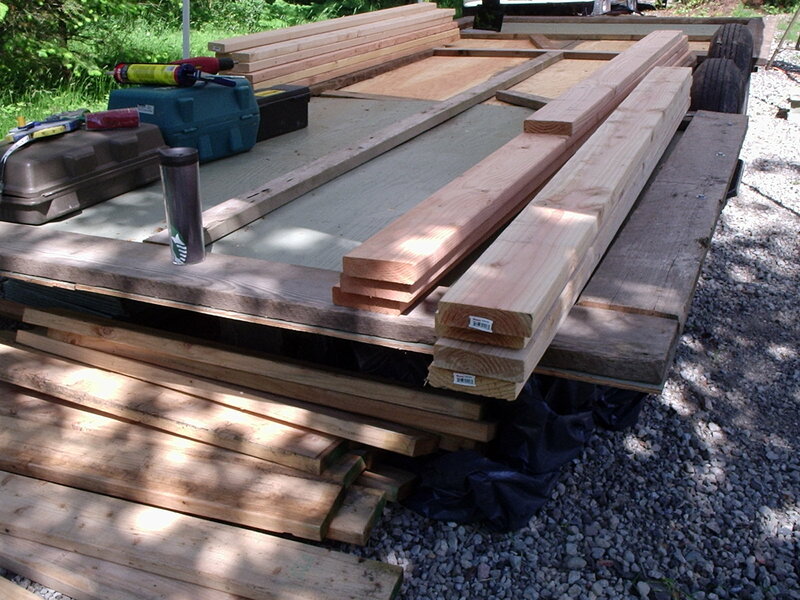 The 2×6 planks stacked up on the sheathing are for wall framing, and are just sitting there after being unloaded from my little hauling trailer. 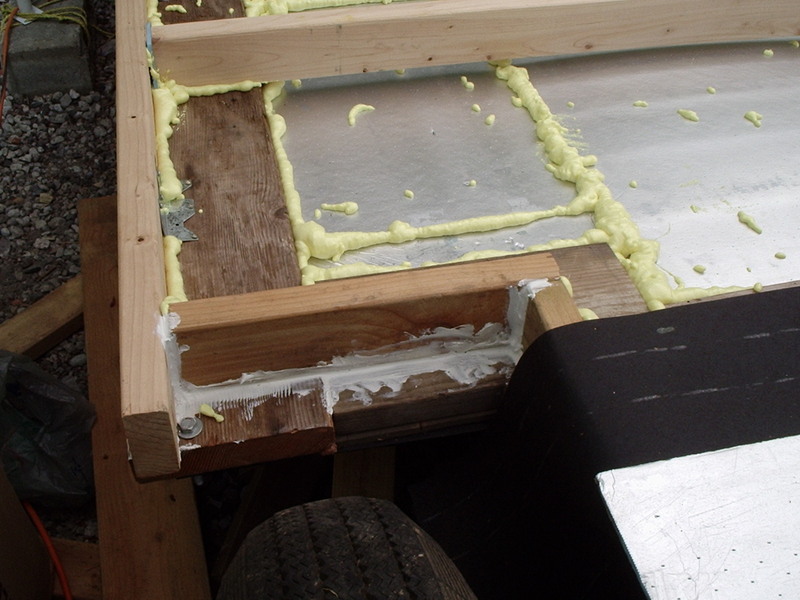 Foil-faced rigid foam covers the wood sheathing. After finishing the screw & glue of the wood sheathing, I filled in the spaces between the 2x’s with 1/4″ rigid foam I had purchased a couple years ago for $6 a bundle. 2 layers worked well, with staggered seams and flexible foam sealant ensuring good protection from water coming up from below. I want to keep my floor “box” as dry as possible. Flexible foam fills in spaces inside the box, and silicone-based flexible sealants fill gaps on the weather-exposed sides. You can’t be too careful with sealing when fighting against water intrusion. I did a lot of research on the best products to use in each step, paying close attention to chemical interactions. It’s important to use compatible materials, or your seals will fail. 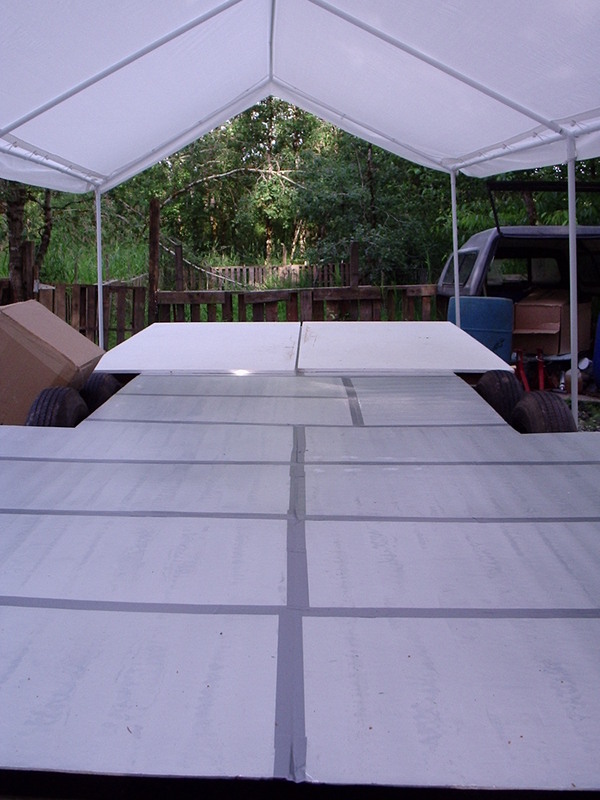 So, the order from bottom up is: painted plywood, rigid foam boards gapped with flexible foam, wool insulation, roofing felt (to repel water from above), and another layer of rigid foam, this time taped up with waterproof tape. So far, so good…. 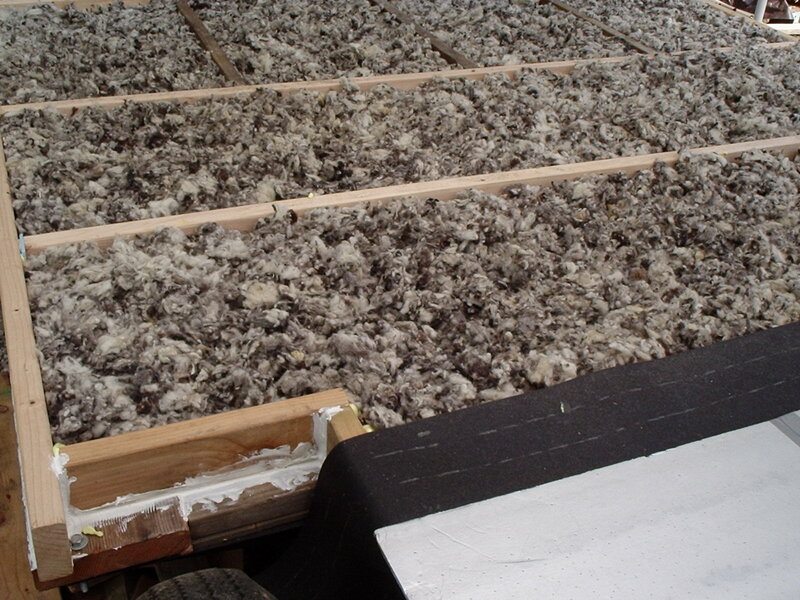 My wool insulation personally delivered by the owner of Oregon Shepherd. See how it all fits into the back of a pickup? Lovely, lovely stuff, wool. Go to http://www.oregonshepherd.com/ for facts about this product. I choose it for obvious reasons: incredibly effective insulator that only works better over time as it always tries to keep expanding, natural and reasonably local, light-weight, long-lasting, and not as expensive as you’d think. I can’t recommend Oregon Shepard enough. 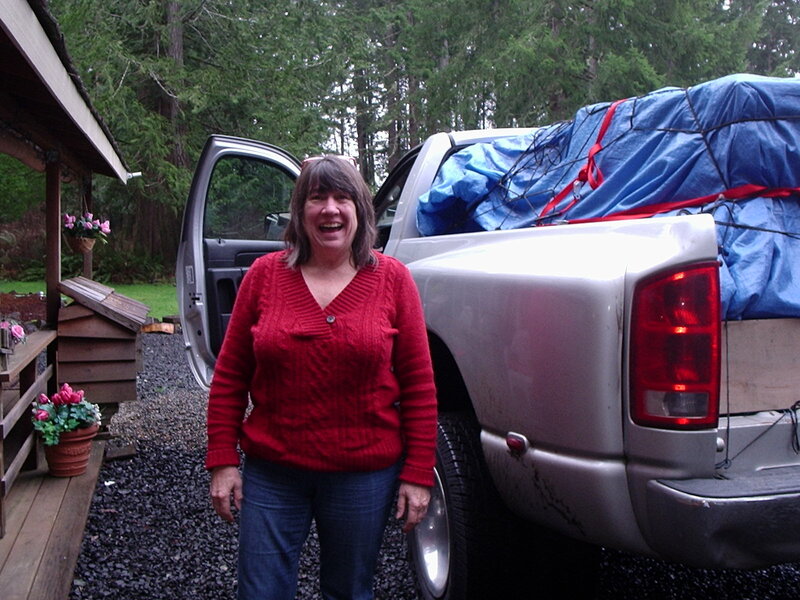 Here’s a picture of the owner dropping off my order FOR FREE (free shipping was included in the purchase price, and as she was driving up my direction anyway, she dropped it off personally. Nice woman.). Another Tiny Home builder used it too: http://littleyellowdoor.wordpress.com/2012/02/10/more-siding-more-wall-paneling-more-insulation/ Funnily enough, I bought my insulation before knowing other Tiny Homers were using it. I thought I was the only one! Next up is the plywood under floor. I decided to put a layer of rosin paper between the rigid foam and the 3/4″ painted plywood. It should keep things from squeaking. No pictures taken, sorry. Next post will cover some of my wall framing experiences (traumas and triumphs). ← Taking the old floor off. Looks like fun, youre doing a great job 🙂 I look forward to seeing more.